In conjunction with the exhibition Asco: Elite of the Obscure, A Retrospective, 1972-1987, Willie Herrón is creating a mural in the alley at City Terrace Drive, behind the Alvarez Bakery (near Carmelita). Herrón has a history with this alley. He was born and grew up in East Los Angeles. One night in 1972, he was driving down the alley on his way home from a party when he came across his younger brother John, who had been beaten and stabbed multiple times with an ice pick. After delivering John to the hospital (he survived), Willie walked home, gathered his paints, and asked his grandfather’s permission to create a mural in the alley behind the house, near his uncle’s bakery. The Wall That Cracked Open was the result, a landmark of Chicano art and a homage to his brother. The new mural, called Asco: East of No West, is based on a photograph by Harry Gamboa Jr. of a 1972 Asco performance, Walking Mural. Last weekend, Herrón toured a group of about forty through the alley in City Terrace to view all of the murals. “The alley was my studio,” he said. “This is where the vision came from. 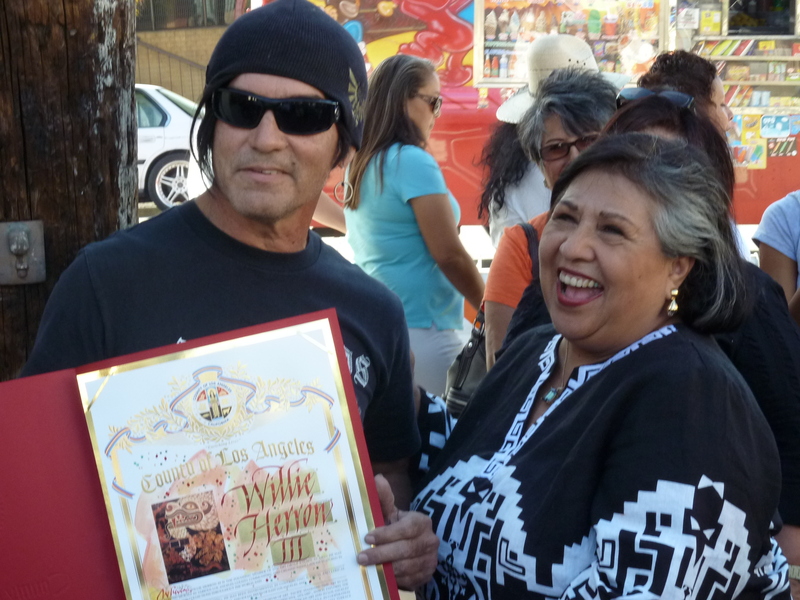 I wanted people who frequented the alley to have art in their life.” Supervisor Gloria Molina was there to dedicate the site, with high words of praise for Herrón and his contribution to the commmunity and to Chicano art in Los Angeles. Willie Herrón receiving his Proclamation from Supervisor Gloria Molina. On November 19th, join us for a bus tour with Asco curators Rita Gonzalez and C. Ondine Chavoya, beginning at the Fowler Museum at UCLA for a tour of the exhibition Mapping Another LA: The Chicano Art Movement. The tour includes a short talk by Herrón at the site of the new mural, and a visit to the exhibition at LACMA. This entry was posted on Tuesday, November 1st, 2011 at 6:02 am and is filed under Uncategorized. You can follow any responses to this entry through the RSS 2.0 feed. You can leave a response, or trackback from your own site. Is there any way the exhibition could be extended to the beginning of January. I would love to come and see it myself as well as show my nieces and siblings. Will there be another tour of the murals in City Terrace? I teach near City Terrace Park (12 years) and would love to take a tour… I could then perhaps do a walking tour with my students. Please let me know how I can get more info! Yes please let us know when there will be another opportunity to view the art. I would be so interested to see the murals on a guided tour. My mom grew up in City Terrace and she would love to see this!